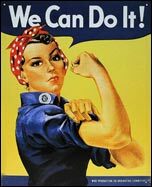 A lot was made of “Rosie the Riveter,” the symbol of women joining the work force at the start of WWII, to replace the men who went off to fight. Cliffside women wondered what all the fuss was about; they’d been at work in the mill for decades. It took a lot of effort to make the products, and women were vitally involved every step of the way: carding, spinning, dying, slashing, weaving, hemming, labeling and packaging. They did everything but drive the train, and, had times been different, would have done that too. And after their shift, they went home to take care of the house and kids, wash the clothes and do the cooking. Until sometime in the 1940s, mill women wore a uniform of sorts, a dress of light blue (some say green, perhaps it was both) trimmed in white. Where did they buy these dresses? Did the company sell them? At cost? Ask your mama, then let us know. Danny Wortman did ask his mama, Maude, and she said women had to buy, at their own expense, the blue chambray material from the cloth store (beside the drugstore). Using a common pattern, they either had to make their own dresses, or hire someone else to make them. It’s still not clear if only the women in the finishing plant had to wear the uniforms, or whether the rule was standard throughout the mill. Do you know?